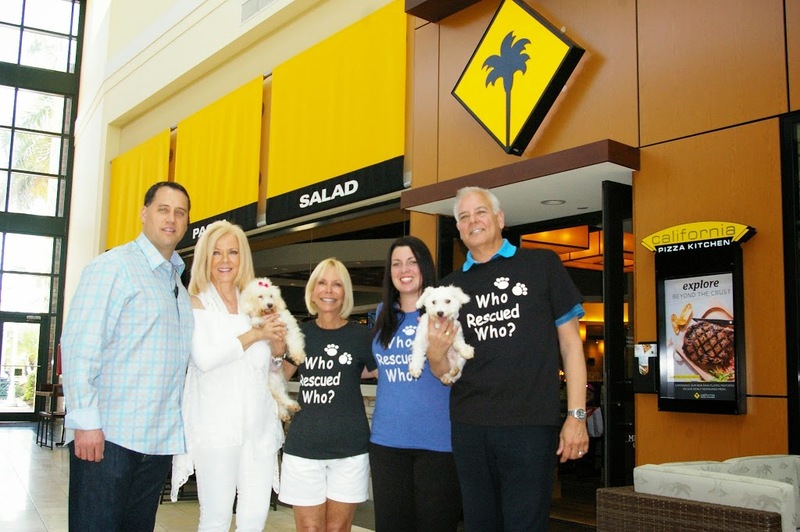 California Pizza Kitchen-Town Center at Boca Raton General Manager Michael Hanzas; Tri-County Animal Rescue Board Member Sharon DiPietro; TCAR Executive Director Suzi Goldsmith; TCAR Assistant Director Amanda Chussler; and Jon Kaye of Kaye Communications. Boca Raton, FL (May 27, 2014) – Tri-County Animal Rescue, the region’s largest 100% no-kill 501(c) 3 animal rescue nonprofit, is teaming up with California Pizza Kitchen(CPK) at Town Center at Boca Raton to co-host six weekly “Tri-County Thursdays” at the eatery beginning June 5th to raise much-needed funds to support the mission of TCAR that operates 100% on donations. TCAR supporters and patrons of CPK need only to print out and bring in a “Tri-County Thursdays” flyer (available from the TCAR website at www.tricountyanimalrescue.com), show the flyer on their mobile device, or mention to their server that they wish to participate in the CPK program to donate 20% of purchases to the rescue center, including dine-in, take-out, catering and all beverages. In addition to raising money for TCAR, each of the weekly “Tri-County Thursdays” at CPK will also showcase “ready to adopt” dogs next to the entrance of the newly renovated restaurant located near Nordstom at 6000 Glades Road, Boca Raton. Two “sets of pets” will be looking to find their “furever homes”, during the first shift from 11:30 a.m. to 2:30 p.m. and a second from 5:00 p.m to 8:00 p.m. According to TCAR Executive Director Suzi Goldsmith, this weekly fundraising and adopt-stop enables TCAR to continue its life-saving work of restoring wholeness on a daily basis to puppies, kittens, dogs and cats in need while providing a safe home, comfort, nutritious food, lots of tender loving care and veterinary treatment until they can be adopted. “We encourage all pet lovers to come out, mingle and dine or take-out large orders on Thursdays for office lunches, family dinners, and birthday parties,” she added. Saving lives in Palm Beach, Broward, Dade and Martin counties and beyond, TCAR is a protective haven to thousands of abandoned, abused or neglected dogs and cats from other facilities in South Florida, Treasure Coast and as far as Sarasota, Alabama, Tennessee, Oklahoma and Louisiana. A top-rated animal rescue center, Tri County has rescued more than 42,000 animals since its inception, offering homeless pets a welcoming forever home, either on campus or through carefully vetted adoptions that total more than 3,000 per year. California Pizza Kitchen, the authority on California-style pizza and an industry leader in creative dining, has recently unveiled its Recipe for Reimagination initiative throughout several of its Florida locations, featuring a complete interior redesign with a new bar and outdoor patio, new hand-tossed California-style pizzas and innovative, California-themed cocktail and wine selections. Located at 21287 Boca Rio Road, Boca Raton, Florida 33433, TCAR is open for adoptions during summer months until July 31st on Tuesdays, Thursdays, Fridays, Saturdays and Sundays from 10:00 a.m. to 4:00 p.m. For more information, call (561) 482-8110. Born in Beverly Hills in 1985, California Pizza Kitchen (CPK) is a leader in authentic California-style cuisine and is widely known for its innovative menu items. California Pizza Kitchen provides a range of California-inspired dishes for guests who Seek the Unique, from signature hand-tossed and hearth-baked pizzas, to imaginative salads, pastas, entrées, soups, sandwiches and hand-crafted cocktails. A Southern California classic, CPK incites international cravings in more than 11 different countries. In 2013, CPK was named America’s Best Pizza Chain in a survey conducted by The Daily Meal and in 2014 was recognized by Entrepreneur magazine and its readers as one of The 120 Most Trusted Brands. For more information on California Pizza Kitchen visit cpk.com. Follow us on Twitter @calpizzakitchen, like us on Facebook at www.facebook.com/californiapizzakitchen and stay connected through http://instagram.com/californiapizzakitchen (#newcpk).